One of the downsides of many basements is that they are wet and damp. This typically happens when water makes its way between the slab and the foundation wall because of cracks in the foundation. If this is the case, it is always best to enlist the aid of a professional contractor to help waterproof the company. Having water in your basement is never something that is good for your home. It can cause mold and mildew to develop, which could make the occupants of your home sick. However, by correcting the problem, you will be able to keep the water away from your new room. Along with this, you may also want to add an air purification system in your basement. This will help to keep stale odors and smells from lingering. But, this is not intended to cover up mold and mildew. Those should still be removed and the issue corrected before you begin your remodel. Before you begin any home remodel, you should check with your area to determine whether you require a permit to finish the job. 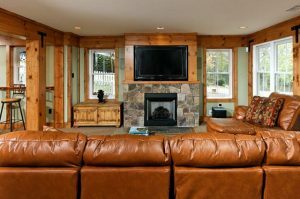 For the most part, a permit is usually required to finish up a basement. For this reason, it is usually best to rely on a contractor to help with the job. While you may be able to complete some of the work on your own, you will need the contractor’s expert advice to complete the project up to code.